Yamaha Golf Cart manuals can be downloaded for you to print or you can purchase a hard copy or a CD. Depending on your needs there are several types of manuals. 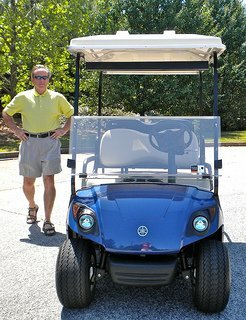 First you will need to know the make and model of your Yamaha golf cart. Then you need to figure out which manual you want. Did you know that Yamaha Golf cart repair advice is available from the company? Yamaha offers free technical support over the phone. I noticed some brief reference to this on their website. Well, I had a repair question regarding a Yamaha gas golf cart and decided to give it a try. I called the 800 number and went into voice mail. But my call was returned within an hour. The technician answered my question and explained that indeed he was employed by Yamaha for just that purpose - to help answer technical questions that you might have about your Yamaha golf cart. The telephone number is 1-866-747-4027 and then press option 8 "For golf cart service and technical assistance." 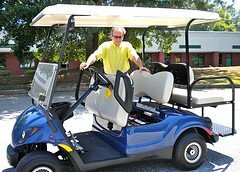 Living in a golf cart community we have several authorized Yamaha golf cart dealers. If you are looking to buy a golf cart or need more professional help in repairing your golf cart, you can locate a dealer by going to the Yamaha website. Just enter your zipcode and the nearest dealers with their contact information will be listed. 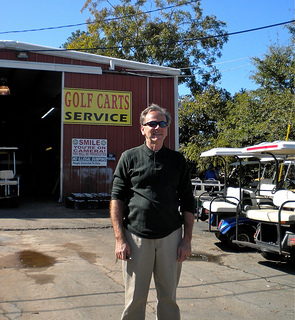 There are several on line golf cart forums where you can post your golf cart repair question and hopefully get a helpful answer from someone who's "been there and done that." Buggies Gone Wild is a very active golf cart forum. They've even divided up the forum questions into categories depending on the type and make of your golf cart. So if you have an electric Yamaha golf cart you go to that forum. If you have a gas Yamaha golf cart you go there. Another on-line option is to pay for an answer from JustAnswer.com. They also post other golf cart questions that have been answered so sometimes you can find a similar question to the one you have and find some guidance that way. Otherwise, it looks like the average cost for a technician to answer you is around $17. If you are a do-it-yourself kind of person, this may be a good route to go if you're stuck. Or if you need an immediate answer this may be a good option as they have technicians waiting on line to answer right away.